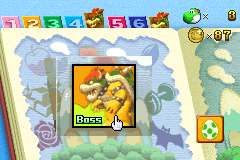 The Tale of Bowser's Fields is Bowser's chapter in Yoshi Topsy-Turvy and appears in between the fourth and fifth chapters in the game. The chapter consists of only one mission, which is a battle against who is believed to be Bowser. Before it begins, Bowser tells Yoshi to try and lock him away if he thinks he can do it. The Spirit Who Loves Surprises controlling the cardboard Bowser. The only mission in this chapter takes place in a cardboard area with yellow and green terrain. Bowser can be seen on the right side of the screen, which is held up by a long pole and will move along with the screen whenever Yoshi moves. Bowser will occasionally spit fireballs at Yoshi which will deal three points of damage to him. The layout of the course starts with Yoshi in front of a cardboard tree with a higher ledge leading to a section with a few rolled-up carpets and Igashira-kun moving on rails. Next, is a short ride with two Lifts after which are three floating platforms with a Big Heart located on the lowest platform. Following is a section with a ride on a Boulder across many spikes while Yoshi must dodge more moving Igashira-kun. After this is a section with some multicolored sliding objects with three hearts located above the green one. The end of the battle follows after a ride on a blue sliding object past two more Igashira-kun. It is revealed at the end that the Bowser is a fake controlled by the Spirit Who Loves Surprises. He apologizes to Yoshi for frightening him, but Yoshi gets angry. He says that Yoshi still has a long way to go to get to the last page and the next chapter starts. This page was last edited on December 16, 2018, at 08:03.